Classy looking, I get lots of compliments. Feels good quality. 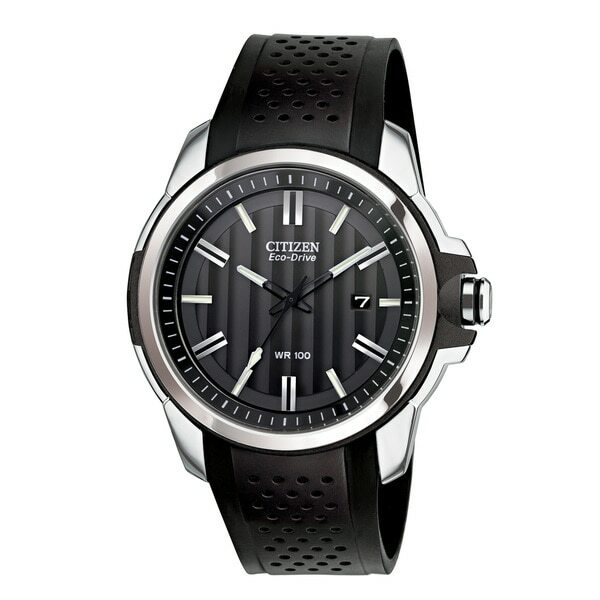 Citizen is a universal leader in cutting edge technology and perfection of design beauty. This men's watch from the AR collection features a silver stainless steel bracelet and dial. Regarding the watch, it’s as you see in the photo, albeit limited. Finish is nice and clean and the actual time is easy to recognize quickly. Some watches, of lesser quality, are hard to see...very cluttered in my opinion. Just a poor design issue I assume. This watch also has some heft, which I prefer. Regarding Overstock.com, the item arrived on time and the transaction was what I expected. Good buy on this one. It arrived before I expected which was a great surprise for me. My husband really like it. Citizen brand has always been a favorite in our house and this one did not disappoint us. Even though the band is a polyurethane bracelet, the watch still looks elegant and it can be worn with casual clothes or even formal. My husband loved this watch!!! The man can't take it off... He loves it. It truly is a great buy. Because this brand always looks so elegant to me, I bought it in the past and it's a good brand and always work good. I also like how it looks on my husband's wrist.